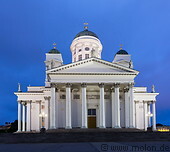 The Helsinki cathedral is an Evangelical Lutheran cathedral located in the centre of Helsinki with white walls and a green dome. It is the most prominent building and a major landmark in Helsinki. Designed by Carl Ludvig Engel in neoclassical style the church was built in 1830-1852. 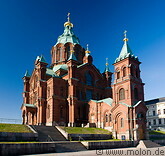 The Uspenski Cathedral is an Eastern Orthodox cathedral dedicated to the Dormition of the Theotokos. Its name comes from the Russian word uspenie which denotes the Dormition. Designed by the Russian architect Alexey Gornostaev the cathedral was built in 1862-1868.